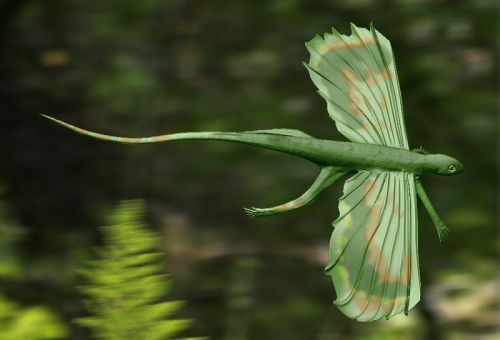 The Kuehneosaur Icarosaurus siefkeri, an early specialised gliding lizard-like form from the Late Triassic of New Jersey. These animals were convergent with, but unrelated to, the Weigeltisaurids of the late Permian. Along with the Archosauromorpha, the Lepidosauromorpha are one of the two main groups of Diapsid reptiles that emerged from younginiform-like ancestors some time during the middle or late Permian. All of these animals started out as small and lizard like, but the Archosauromorphs quickly developed large size and specialised forms, to dominate the Mesozoic world, wheras the Lepidosauromorphs retained their original lizard-like appearance and structure. Although the archosaurian affinities of dinosaurs, crocodiles, pterosaurs and birds are clear, and likewise the lepidosaurian affinities of lizards, snakes, and the tuatara and its relatives, the problem is in deciding where the other various specialised forms that emerged during the Triassic period go on the reptilian evolutionary tree. Are Ichthyosaurs, Plesiosaurs, Thalattosaurs, Hupesuchians, Drepanosaurs, Choristoderans, and the Chelonia (turtles and tortoises; which are among the most ancient and specialised of all extant amniotes) closer to the lepidosauromorph or the archosauromorph stem, or did they branch off at an earlier time? The controversies are far from being solved.